As the end of January approaches, that New Year’s resolution you were so adamant about just a few weeks earlier is already starting to fall by the wayside. Suddenly, the gym seems farther away, cigarettes call your name, and you haven’t even taken the cellophane off that scrapbook you bought. While we can’t do much to help you with those fading pledges, there is one resolution to which we can assist you in remaining faithful. The ’70s were a great time for action films, and the two biggest names of the era were Lee Marvin and Charles Bronson. Here’s a sampling of their best. The Mechanic: Bronson takes a young Jan-Michael Vincent under his wing; showing him the ropes of contract killing. The complex relationship between the two characters, the slow, methodic storytelling, and the dramatic ending make this one of ol’ Charlie’s finest. Point Blank:Lee Marvin inhabits Donald E. Westlake’s Parker in this gripping, deliberate crime thriller from John Boorman. Why anyone would want to mess with a guy like Lee Marvin is beyond the limits of reason. Death Hunt: Can’t decide which actor to watch first? Why not watch them both in this early ’80s wilderness actioner. Violent, well-constructed, and featuring one of the decade’s most interesting games of cat-and-mouse. Tiger Cage: Legendary fight choreographer Yuen Woo-ping expertly directs this unsung cops vs. criminals actioner. The opening sequence, an unfettered gauntlet of carnage, alone is well worth the price of admission; an unfettered gauntlet of carnage. Ip Man: Donnie Yen brings to life one of China’s most beloved historical figures, and does so with some of the fastest and most impressive kung fu in recent memory. Hard Boiled: John Woo earned his reputation working in Hong Kong, and Hard Boiled may be his masterpiece. 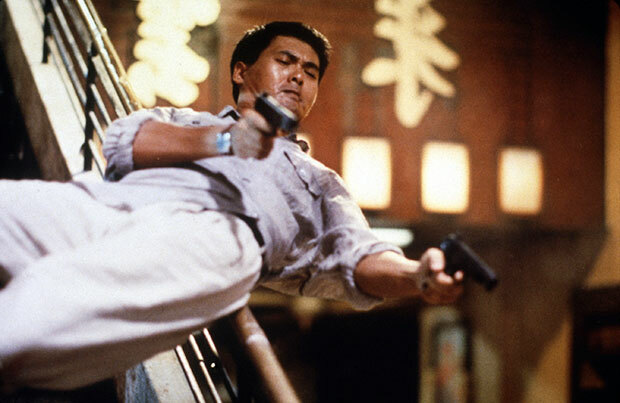 Chow Yun-fat eloquently dances through Woo’s gorgeous bullet ballet. Sleepless Night: France may not be the first country one associates with action cinema, but they’ve made huge strides in recent years. Sleepless Night is a single-night nonstop crime story that rages through a nightclub like a force of nature. The cinematography, pacing, and exceptional performances create an organic sense of tension. Man From Nowhere: Nobody, but nobody, does revenge movies like Korea. The Man from Nowehere is a savage, uncompromising descent into the darkest recesses of the soul of someone we still, despite everything, herald as a hero. Solomon Kane: It took a French/British/Czech co-production to finally bring Robert E. Howard’s puritanical superhero to the big screen, but it was worth the wait. Solomon Kane combines horror, fantasy, and superhero conventions to create a truly unique filmic experience. James Purefory broodingly and perfectly inhabits the titular antihero. These aren’t your granddad’s horse operas. Dudes: A cross-country road trip turns tragic for a trio of rockers in this outstanding ’80s gem from Penelope Spheeris. She uses punk rock to breathe new life into an age-old genre. The Red Hot Chili Peppers’ bassist Flea has a prominent role in the film. Sukiyaki Western Django: A wild mashup of Yojimbo and Sergio Corbucci’s Django, Sukiyaki Western Django is somehow still unlike anything you’ve seen before. Comin’ At Ya! : Of this group, Comin’ At Ya! most closely resembles a traditional spaghetti western, but the filmmakers behind it were keen to bring back the then-languishing 3D technology. If you thought the recent spate of 3D films in theaters were gimmicky, just wait until you see the prolific and hilarious instances in which Comin’ At Ya! finds ways to, well, make things come at ya. The Long Goodbye: Possibly the best film on this entire list. Elliot Gould, as Philip Marlowe, wafts through a seedy, almost dream-like Los Angeles. Gould’s effortlessly charming performance is enhanced by Robert Altman’s superb direction and a marvelous, if slightly unusual John Williams score. An absolutely masterful film that, incidentally, makes a great double feature with The Big Lebowski. Elevator to the Gallows: Film noir is sprinkled with traces of Hitchcock in Louis Malle’s Elevator to the Gallows. A fledgling criminal murders his boss while their office building is empty, but his escape is hindered by a busted elevator. Tense, engaging, and given a pulse by a smoky cool Miles Davis score. The Killing: An early Stanley Kubrick film hits upon the director’s substantial talent for storytelling. A flawless racetrack heist gives way to squabbling and conniving between a team of crooks. Its great cast anchored by Sterling Hayden, The Killing is gorgeously shot and harrowing to the last frame. Freebie and the Bean: It’s hard to do buddy cop films better than Freebie and the Bean. James Caan and Alan Arkin set the standard for unlikely law enforcement duos, constantly at each other’s throats as they do all in their power to get the better of crooks and thugs. Their banter is among the film’s greatest strengths. Nighthawks: Sylvester Stallone doesn’t get a lot of credit as an actor, and maybe rightfully so, but in 1981’s Nighthawks, he and Billy Dee Williams are a formidable team. The perpetually fuming pair take on an international terrorist played to icy perfection by Rutger Hauer. Busting: Elliot Gould returns to the list, this time working alongside Robert Blake to bring down a crime boss in Peter Hyams’ Busting. These two are laughably bad at their jobs at the onset, and that is meant as a compliment, but their ability to get serious when it really counts gives the movie a great deal of charm.